Ted Folkman at Letters Blogatory posted a rather dismissive take on a recent letter I signed to the UN Special Rapporteur for Human Rights Defenders (now on Twitter!) on the situations facing the human rights defenders in the Chevron/Ecuador case. My response below (also published by Ted). I’ll briefly respond to one point and add one observation. As someone who watched things unfold, I can say that Ted’s speculative claim that “the reason Chevron’s threats were so potent was because there was some underlying wrongdoing that made Patton Boggs and the others perceive a serious risk of liability” is wrong. It is true, as he says, that some “allies” like Burford were “spooked,” in the sense that as soon as they heard Chevron’s allegations they starting looking for the exit (including, in Burford’s case, by coordinating with Chevron behind their own clients’ backs). Others were the victims of flat-out, unapologetic economic extortion campaigns, such as folks from Stratus Consulting, the company that Chevron brought to its knees by crushing it with litigation, intervening in a dispute with its litigation insurer to make sure the insurer would not cover the litigation expenses, and sending smear-campaign letters to Stratus’ other clients. (How we all tolerate this kind of conduct as just “part of the game” is beyond me.) But allies who took the time to unpack Chevron’s allegations and really understand the facts did not end up abandoning ship. Ted thinks Patton Boggs is an example of someone “spooked” on the facts, like Burford, or a victim of extortion, like Stratus. Not so. In reality, there were two Patton Boggs—the team that actually worked on the case and understood it, and the rest of the firm that couldn’t care less (and was reportedly mystified at how the firm ended up going up against a wealthy corporation like Chevron in the first place). A great untold story in this case is the heroism of the Patton Boggs team on the case. These men and women worked like dogs, for years, long past when there was any money coming in or any prospect of money. They faced constant attacks not just from Chevron but from corporate apologists in their own firm. And they never gave up on their clients. The larger firm settled with Chevron without telling them, to salvage a merger that was driven by economic considerations far beyond the Chevron case. The team that worked on the case was forced out of the firm in the process. Yet to this day they are proud of what they did and they should be. As has been recently reported (Vice, Courthouse News) the arbitral tribunal hearing Chevron’s baseless “denial of justice” claim against the Republic of Ecuador (through which Chevron hopes to put Ecuador “on the hook” for the environmental judgment that private Ecuadorian plaintiffs won against Chevron in Ecuador’s courts) conducted a series of “judicial site inspections” of the abandoned waste pits and other contamination at Chevron’s former oil operations sites in the Ecuadorian Amazon. The transcripts of the inspection proceedings are available here. For someone who was intimately involved in the judicial inspections process in the original case back in 2005-2006, reading the transcripts is an experience thick with déjà vu. The same scene: roosters crowing, sudden torrential rains, heat and insects, strained jokes about trying to hold it all together in a jungle setting. 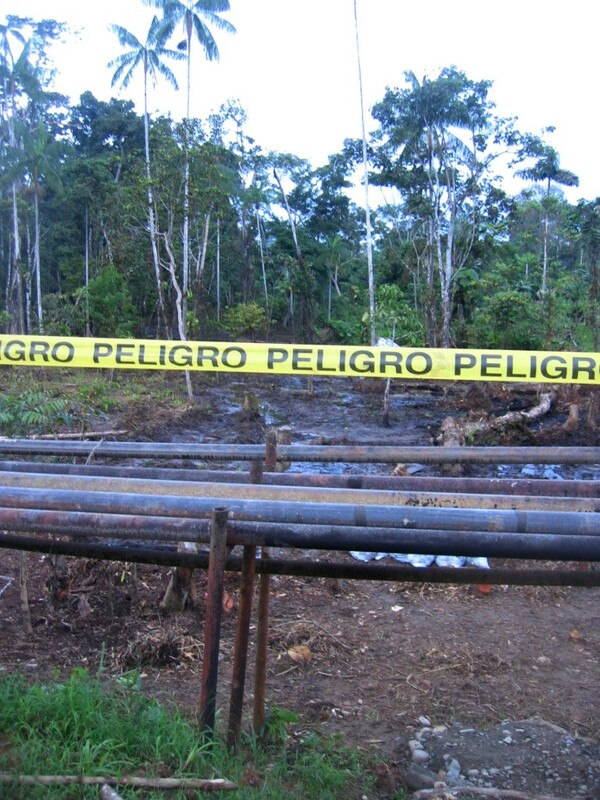 The same arguments: the open pits, the hidden pits, the produced water dumping system, the bogus remediation; and from Chevron: the RAP, the RAP, the RAP (i.e., the settlement which Chevron pretends released it from taking responsibility for the majority of the contamination, except that the private claimants in the Ecuador case were not party to it and in fact it expressly stated that it did not apply to their claims). In between now and then, the same sites — ridiculously obviously contaminated sites — have been examined again and again and again and again, by government investigators, expert teams for various parties in various litigations, various human rights delegations, and countless celebrity and other observers. How long can Chevron continue to drag the world through this charade? In fact, with all respect to Ted, what most people see is not migration of contaminants, but toxicity, sickness, and death, especially if their visit is combined to any degree with discussions with local residents about their invariably tragic family histories. To the extent most peoples’ thoughts stray into the legal realm, they typically start with questions of criminality, recklessness, negligence, and a commensurate call for justice. A decade ago, shortly after I left full-time work on the case, Chevron made a public promise that it would inflict “a lifetime of appellate and collateral litigation” on the plaintiff communities if they dared to continue with their case and push it through to judgment. One cannot argue that an oil company like Chevron is not wise in the ways of the world and the halls of power; it knew it could inflict just such a fate, and it has. Chevron has laid its cards on the table. It knows what it is doing. Now it’s our turn — “our” most broadly, basically everyone in society who is not Chevron or a reflection of its bottomless self-interest. What are we doing? The world will have to change if this company is going to change course. Maybe it is changing already. I have read that Americans are now buying Kalishnikovs in numbers sufficient to help subsidize Russian rearmament, to help their manufacturers achieve economies of scale. In the old days these famous weapons were made with the thought that they would be used in a land war between great powers, that is, that they would kill Americans. Now, since they are being brought into this country, the odds are great that they will indeed kill Americans. What’s Chevron’s Ecuador Play in Canada? The big news in the ever-ongoing Chevron/Ecuador dispute is the recent decision by the Supreme Court of Canada rejecting Chevron’s ultra-preliminary attack on the Ecuadorian communities’ ability to seek to enforce their historic $9 billion environmental judgment against the company in Canada. The attack was bogus from the get-go; a little noticed fact is that no Canadian court embraced the theory that Chevron ultimately presented to the Supreme Court, but based on a strange petition/counter-petition process it ended up there anyway. The frustrating part is that this victory — a huge one for the communities, at Canada’s highest court — really only starts the process at what should have been the beginning. Through aggressive (to the point of abusive) lawyering, Chevron wins another three years time evading the Ecuador judgment and wastes a ton of the communities’ resources in the process. A sadly familiar story in this case. That said, beginning the enforcement process genuinely in Canada is undeniably huge. The litigation shenanigans will continue, but Chevron’s options are dwindling. Chevron is particularly scared of Canada because certain unique features make their primary line of defense — the “corporate veil,” or in Chevron’s case, no less than seven corporate veils between Chevron Corp. and its Canadian assets — potentially irrelevant, a true Maginot Line. Chevron recently filed its “answer” to the enforcement petition, which outlines its strategy ahead. Some early comments are provided by The Chevron Pit. Chevron’s approach is pretty much as expected. Chevron wants to relitigate every issue that it lost in Ecuador, including issues that are clearly questions of Ecuadorian law for the Ecuadorian courts. Good luck with that. It is also jump-starting the ol’ “demonization” campaign, in which the company tried to taint the Ecuador judgment and the communities with allegations of bribery and fraud, but did so by relying of paid-for “fact” testimony from a ridiculously corrupt witness (whose testimony has now been disproven by forensic analysis), and by blowing out of proportion a handful of controversial issues in the Ecuador trial process — issues that were raised and addressed on multiple layers of appeal in Ecuador. As long as the system as a whole got it right — and Ecuador’s system certainly did so in this case — complaints about this or that at the trial level have no bearing on the final judgment and are likely to be ignored by Canadian courts. The fact that, in Canada, Chevron lawyers appear to be “going all in” on the corrupt bribery witness despite his disproven testimony, and that fact that he was an embarrassment in a related arbitration proceeding, is revealing of just how few options Chevron has left. They would have left this witness in the dust and moved on by now, if they could.